This submission to the Australia Productivity Commission responds to a recently published PricewaterhouseCoopers report on Understanding the Costs and Benefits of Introducing a ‘Fair Use’ Exception, prepared for APRA, AMCOS, PPCA, Copyright Agency | Viscopy, Foxtel, News Corp Australia and Screenrights (“PWC Report”). 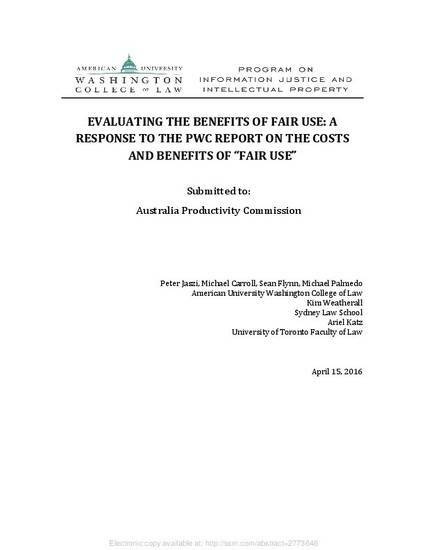 The PWC Report does not provide a sound evidence base to evaluate the true total costs and benefits that the introduction of a fair use rights would have in Australia. Part I points out how the PWC Report fails to adequately define the nature of the real change being proposed in Australia – which is effectively to subject its existing fair dealing clause to an open list of potentially lawful purposes. Part II provides a survey of a range of benefits that the opening of Australia’s fair dealing clause to resemble the U.S. fair use doctrine may have, drawing from published research on the topic which is not canvassed by the PWC Report. Part III analyses the PWC Report’s evaluation of the costs of adopting fair use, criticizing the Report’s basis for concluding that adopting fair use will lead to massive shifts from licensed to unlicensed use of works, a litigation explosion and the destruction of all collective management organizations in Australia. The diffuse and forward-looking benefits of open exceptions like fair use may be hard to measure, but they are no less real. The PWC’s evaluation of the costs and benefits of fair use are not real. It is full of imagined horror stories that are unlikely to take place in fact and should be disregarded in their entirety.